This September a beast of legend descends upon League of Angels II! 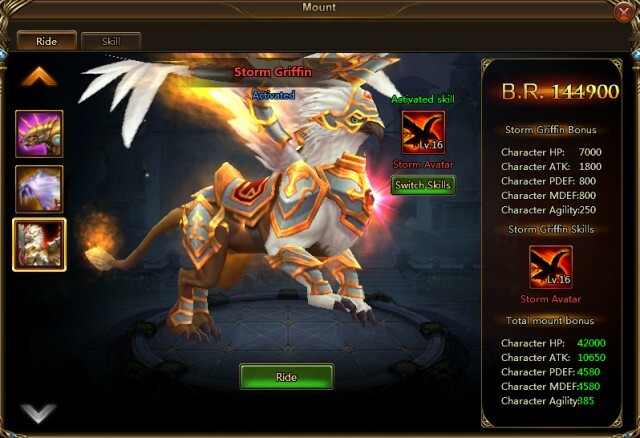 The free to play browser MMORPG is introducing a brand new mount to the game, the majestic Storm Griffin! From the Thunder Peaks in the West, the Storm Griffins reign as the King of Beasts and are known as one of the most difficult beasts to tame. Great champions far and wide have climbed the peaks in hopes of obtaining eternal fame and glory. Perhaps you are the next? The Storm Griffin is a truly majestic sight to behold. Intricate armor cover its beautiful silvery feathers and golden brown fur. While soaring through the skies, their huge wingspan casts massive shadows on prey below while their sharp claws hint at their fearsome power. To tame and ride a Storm Griffin has become a sign of greatness and nobility that all great warriors in Sapphire strive for. The Storm Griffin is a Mythic Mount and it’s unique skill “Storm Avatar” definitely lives up to it’s mythic status. At the start of every battle, Storm Avatar provides your entire squad with a powerful Attack and Agility buff for 3 turns. In addition, just possessing this mount will greatly increase your character’s HP, ATK, PDef, MDef, and Agility passively! Looking to rule the skies on your very own Storm Griffin? Then be sure to participate in the Lucky Tree event taking place from Sept. 23rd to Sept. 25th for a chance to own this mythical beast! Play League of Angels II today and don’t miss this great opportunity!